What do you wear to the loud office? Many different places can constitute a loud office and when you’re a rock musician things are normally pretty loud wherever you go. The loud office can be a playback in the control room of a recording studio. It can be a rehearsal room with a full tilt rock band practicing new songs. The loud office can be a sound check at a club, or on a big arena rock stage. Quiet shoes are always what to wear in and around any loud office. Because when microphones are live you don’t want to be the one click click clicking across floor. Also crepe souls are recommended above the squeaky rubber kind. Any loud office is not only loud inside but also outside in the surrounding areas and the the loud office itself can make it next to impossible to carry on a conversation or a phone call. This can cause you to venture out into some rugged surrounding terrain so make sure your shoes are not only quiet but sturdy and reliable plus you should have an extra layer against any weather you may encounter as you may find yourself flung far from shelter. Since practical, almost industrial, outfits are a must in or near the loud office what are you going to wear then to maintain a moniker of style? Teeshirts are like uniforms at the loud office but they can also be altered by cutting straight across the neck making a plain Teeshirt into a more feminine off the shoulder statement. I love the wardrobe adaptations you mentioned. VERY creative! Nancy, you should considering writing a book about tips to living on the road and in hotels, and all the creative things I’ve read that you’ve done over the years. You should also include lots of ugly carpet photos you’ve taken. I always found your tips on living on the road fascinating….and sometimes really funny! PS. So happy to see you doing something a little different from Heart for a bit. Hope RR comes through the PNW!! T shirt purchase site please??? Never thought about quiet shoes in the loud office — brilliant! Looking forward to hearing the whole crew, shoes and all, in Sept. to bid a proper farewell to the Palace with Seger! I’ll be darned! you are the Practical Stylist! 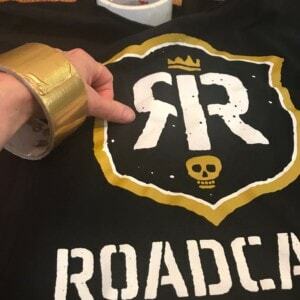 And how does one get a Roadcase Royale T-Shirt?